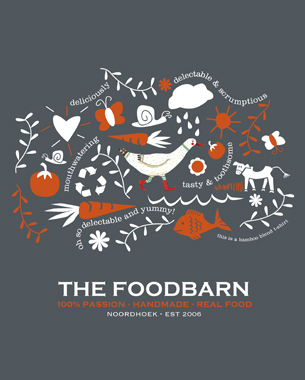 The Foodbarn required a series of T-shirts to be designed. These were to be worn by their staff and could also be purchased from the deli shop. With a very strong identity already in place with their distinctive goose, it was important to retain this key element while creating designs that encapsulated the Foodbarn’s offering. The design “Golden Egg” uses a typographic illustration of an egg made up of adjectives describing the food, while “Nature’s Best” uses graphic illustrations of food and plants in combination with adjectives describing the food. The t-shirts were printed on Bamboo blend fabric.